Welcome to January's issue of the Dereila Nature Inn newsletter. 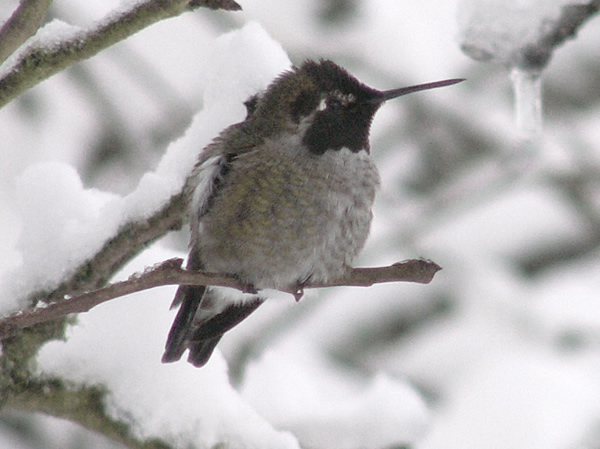 We start off 2012 with an Anna's Hummingbird in the January snow. It's a chilly scene but comes along with a warm greeting to you. Welcome to another issue of Whispers, the newsletter of the Dereila Nature Inn - your virtual nature centre. 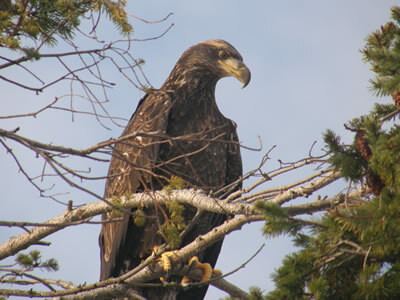 As we start 2012 we are also starting the sixth year of the Dereila Nature Inn. It's amazing how quickly the years have flown by and how large our nature site has grown. We want to thank you for your support over the years and all of your suggestions, encouragement and contributions. Best wishes for a wonderful year! Please join us on Facebook where we welcome your comments and ideas. Which female bird is called a pen? 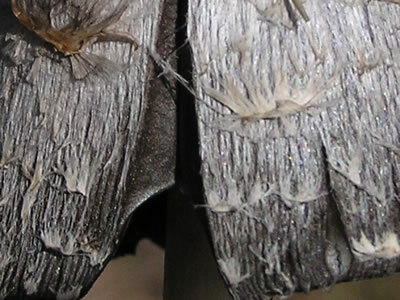 Do you know what this cropped close-up photograph is? You'll find the answer at the end of the newsletter. For more of this type of mystery solving, be sure to visit our pages of Close-ups in Nature. Here's another selection of cropped images for you to identify. This project makes an interesting feeder in which you can hang berries as well as provide suet. This feeder provides a place for you to mount a piece of fruit on one side and a suet cake on the other. Find the latest additions on the news/updates page. We invite you to submit nature photographs to this section. 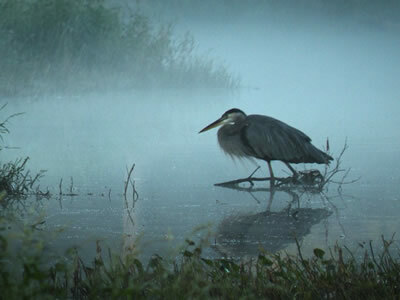 This month we have another super variety of nature images. 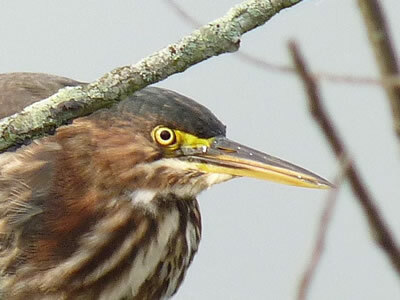 Joyce Nolan, Lancaster, OH, submitted this excellent shot of a Green Heron. 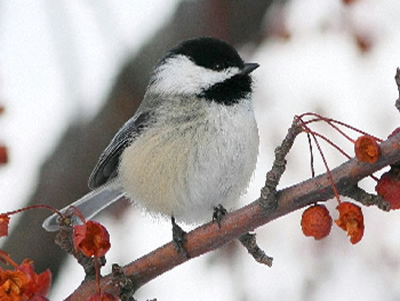 Black-capped Chickadee in a winter scene, by Frank and Sandra Horvath, Grimsby, ON. 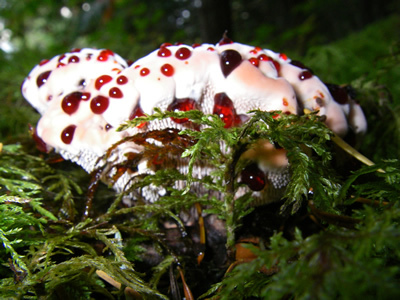 Strawberries and Cream Mushroom, Hydnellum peckii, from Dave Harper, Surrey, BC. 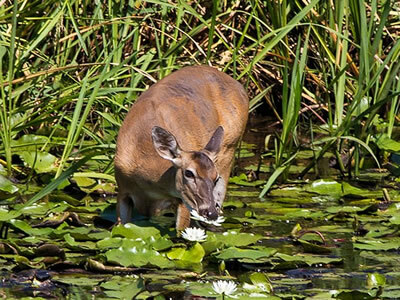 White-tailed Deer having lunch in a lily pond, from Judy Howle, Columbus, MI. We really appreciate you taking the time to send in these fantastic photographs. simply send us an e-mail. We'd love to hear from you! 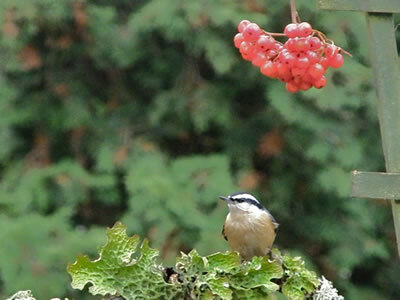 This month's feature is called "Birds and Berries." 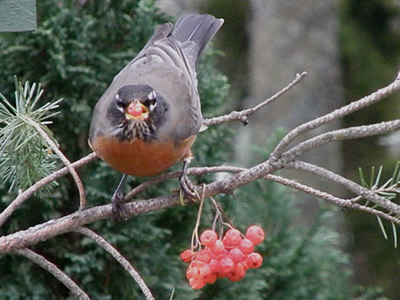 It's a collection of photos featuring a variety of birds that have dropped by the feeding station to enjoy feeding on berries. Visit the page by clicking here. This month we wander down to a river on the west coast. there are tasty pickings to be had! Here's our monthly image ready for your humourous caption along with a couple of our ideas. Number one: "It's the latest fashion!" Number two: "Five minutes under the drier and I'll be fine." If this month's photo inspires you, please send us an e-mail. 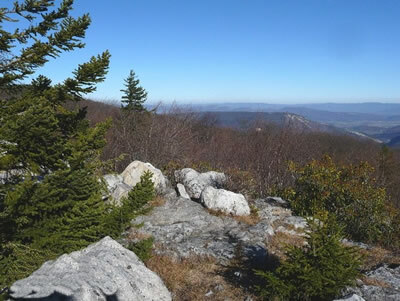 Stunted trees, wind-carved boulders and grassy meadows characterize Dolly Sods Wilderness in the scenic Monongahela National Forest in West Virginia's Allegheny Mountains. Many thanks to Joyce Nolan, Lancaster, OH, for taking us to this part of the world. If you think you have a suitable nature photograph for this section please send us an e-mail along with a brief explanation. We look forward to your submissions. Scouring Rush, Equisetum hyemale, is a member of a small group of plants called Horsetails (Equisetum) because of their resemblance to a horsetail, although it's sometimes hard to see the resemblance. 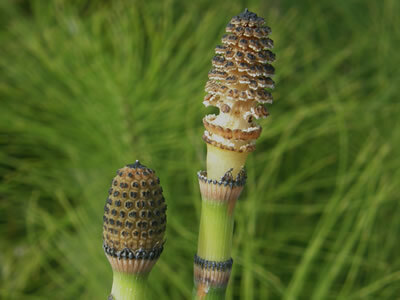 Equisetum come from the Latin words equus (horse) and seta (bristle). Hyemale derives from the Latin word hiemis meaning winter. A reference perhaps to the fact that in the temperate areas this plant is found, it is an evergreen. The common name is a reference to the fact that is was once used to scrub things clean. 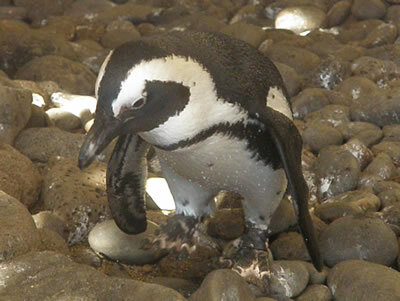 A penguin went into a restaurant for his dinner. About halfway through his meal he noticed the baked potato had big brown spots going all the way through it. He called the waitress over. "This potato is bad," he said. The waitress picked up the potato and smacked it and then put it back on his plate. "Sir," she said, "if it gives you any more trouble, you just let me know." Now is the time to hang up those bunches of berries that you harvested in the fall and put in the freezer. This lichen-covered perch creates a good spot for the birds to land. This Red-breatsed Nuthatch is just resting for a moment. 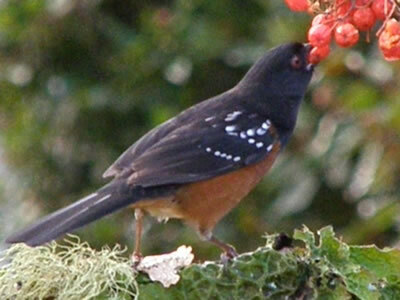 A Spotted Towhee takes advantage of these tasty treats. 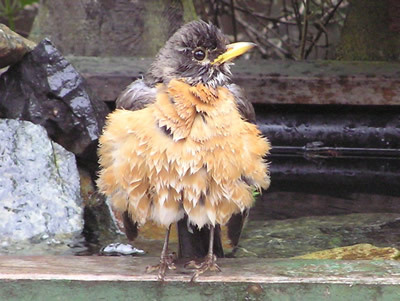 Hermit Thrushes and American Robins will also drop by to help themeselves. 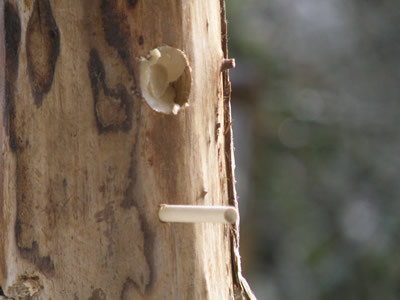 Some birds have difficulty clinging to wooden log feeders. 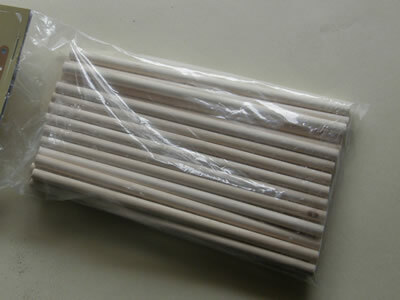 Packets of small dowels are available at dollar stores. The dowels make great little perches! About 2 inches under the feeding hole, drill a hole the same size as the dowel and push the dowel in. Success! 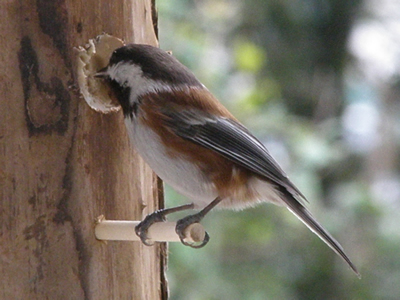 This Chestnut-backed Chickadee takes advantage of the perch. Want to make some Bark Butter or Chickadee Pudding? We have lots of interesting recipes for making bird food for your bird feeding station. Check them out by clicking here. Also, if you're wondering which food attracts which birds, we have a handy guide ready for you here. Photo Notecards Now on Sale! To help pay for the costs of running the Inn website and providing this newsletter we are now selling a selection of blank photo note cards. We have two sets - birds and special places and will be adding more in the future. They cost only $3 each or a real deal at 4 for $10 with free postage! For more information and to place an order using PayPal, please click here. 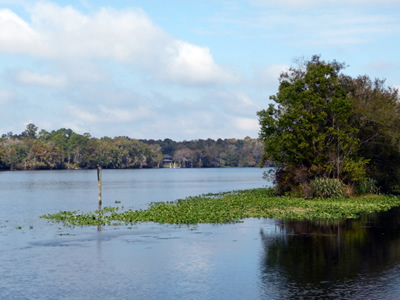 In Manatee Springs, Florida, the Suwanee River flows gently along its way. It is almost 250 miles/400 km long. Many thanks to Marylyn Flanigan of Florida for submitting this super photograph. 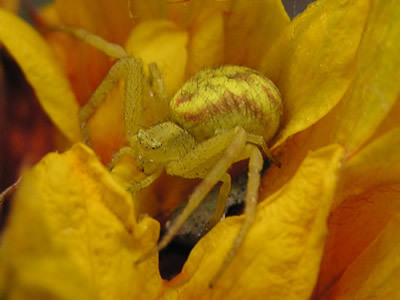 Did you know that Goldenrod Spiders, Misumenops celer, can change colour to blend in with the flower that they occupy? 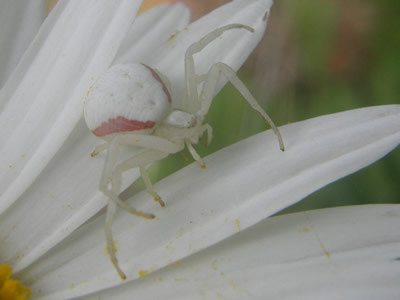 This one is well-camouflaged on a white daisy. of official flowers. 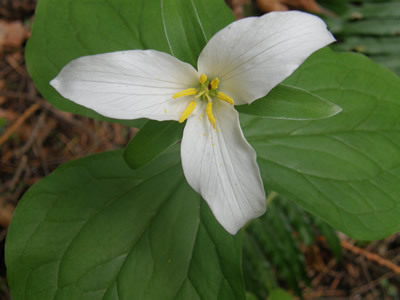 The Large White Trillium is the state flower of Ohio. To see our collection of state and provincial flowers just click here. 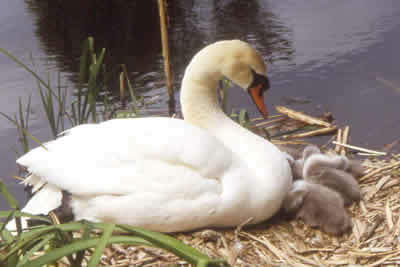 The female swan is called a pen. 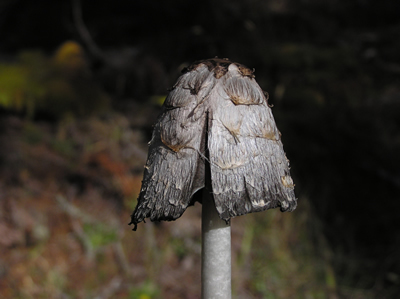 This month's close-up image is a Shaggy Ink Cap Mushroom, Coprinus comatus. We hope you've enjoyed our newsletter for this month and that you'll forward it on to your nature-loving friends. Watch for the next issue of Whispers in your inbox during the first week of February. See you then!